It's no secret that our beloved pets can cause damage, some of it serious, to our homes. Thus, www.MyJobQuote.co.uk polled 2,263 people over the age of 18 about whether they've ever had to do repairs to their property following damage done by their pets – the answer, for 79 per cent of us, is 'yes', with 32 per cent of respondents admitting having had to replace broken furniture, 18 per cent having dealt with a ruined carpet, and a further 14 per cent having had electrical cables chewed. These are interesting figures, not least because all of these types of damage are preventable. Having pets doesn't have to mean forking out hundreds of pounds a year to repair damage caused by them. We look at five time-tested ways to prevent pet damage to your home. If an animals has claws, they will want to use them. The main thing to know is the reason why they're scratching. As a general rule, dogs scratch to get attention, while cats scratch simply because it feels good. So, your strategy for minimising this behaviour will be different dependent on your type of pet. Dogs will often scratch for attention (and are particularly good at destroying front doors) – so, hard as it may be, don't give in to them. If your dog is scratching the door to go outside, try re-training them by putting them in another room and only opening the door when they stop scratching. Cats mainly scratch because they like to keep their claws sharp (also a necessity if they go outside and climb trees). There is no way you'll be able to stop a cat from scratching altogether, but you can retrain them to scratch a scratching post over time. Consistency is key: if you fail to tell off a cat scratching furniture one time out of 10, your cat will think it's okay to scratch the furniture. So, be firm. As a last resort, try rubbing a bit of citrus essential oil on your furniture (always patch-testing first to avoid discolouration), as cats hate citrus smells. Chewing and scratching can both be signs of boredom, and, in extreme cases, even depression in your pet. Pets need plenty of physical exercise, but they also need mental stimulation and affection – and the main source of both is their owner. Try to spend at least 10 to 20 minutes each day interacting and playing with your pet, especially when you get home. Outdoor cats may need less interaction, but they will still need a bit; be wary of leaving multiple pets to their own devices, thinking they will entertain each other. Domestic pets have been bred over thousands of years to interact with humans, so not getting attention from their owner makes them despondent and more likely to act out by chewing. There are few worse things for a pet owner than coming back to a foul 'present' at home. What you should never do is ignore this unwanted behaviour in your pet, even if it happens once. Cats are especially fastidious, and if a cat is using anything other than its litter tray/outdoors as its toilet, this is either because the litter tray is dirty, or because the cat has an underlying illness. Dogs may urinate out of excess excitement or separation anxiety, which will need to be addressed as a behavioural issue. In any case, a visit to the vet is always advised. Speaking of behavioural issues, it's much easier to train a puppy than an adult dog (hence the 'old dog, new tricks' saying), so, however cute your new puppy might be, they ought to be trained in a dog-appropriate way. 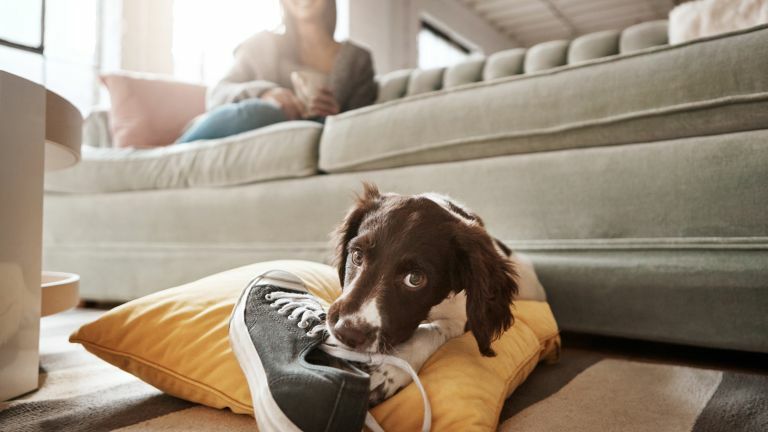 Common mistakes that lead to behavioural problems and property damage are: fussing your dog too much before leaving the house (cue separation anxiety); not establishing a hierarchy early on (dogs need this as they are pack animals); and picking up your puppy too often. If you have a busy lifestyle and don't have the time to reinforce rules when it matters, send your puppy to puppy school – it will more than pay for itself throughout the many years you'll have with your pet. As for cats, is it true that they can't be trained? Well, yes and no. Cats like to do as they please, but they dislike being told off that little bit more, so, if you are consistent in voicing your disapproval, they will stop eventually (think weeks, sometimes months). Even the best-behaved pets in the world will sometimes have accidents (cue this author's cat knocking over a favourite vase while in frantic pursuit of a bumblebee). We advise against ever bothering with damage insurance, because most insurance providers have clauses that exclude almost everything that realistically can be caused by a pet (apart from accidental damage to someone else's property, but even that usually doesn't cover everything). So, and especially if you own an active and inquisitive breed of pet, put a bit aside for that one time they go a bit crazy. Hopefully, with the help of our advice, it'll only ever be a couple of times throughout their lifetime.